Having a clear process to follow during Employee Exits will ensure you protect your business and its assets, and help the Employee leave with dignity. It is also a great time to get feedback from them about their time at your place. 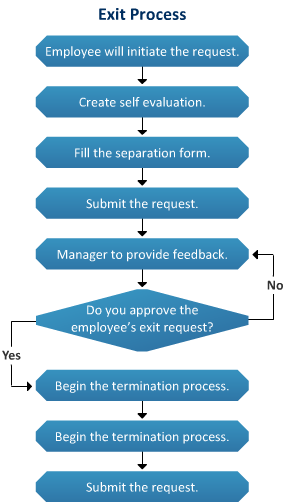 The purpose of an employee exit policy is to have a process in place when an employee is leaving your employment (resignation, retirement, end of contract etc) When an employee resigns from their position, they should submit a written letter of resignation to their immediate supervisor based on what their notice period is. This could be stated in the employee’s letter of engagement or (if no letter exists) be linked to the National Employment Standards notice table…. During the employee’s notice period; they must continue to assume their normal responsibilities and should assist with a handover to the existing team or their replacement if in place. An exit interview is often overlooked but is an extremely valuable organizational effectiveness tool. The purpose of exit interviews is to understand the employee’s perceptions and experiences and get feedback about the job the employee held, their work environment, and your place. A good exit interview system can help reduce turnover and increase employee satisfaction and commitment by addressing some of the things that people are leaving because of. Make sure they and their supervisor sign off on the checklist when it is done. In the end, it is always nice to part on good terms, and you never know the person leaving your employment may become a client or refer business to you in the future. We always say that it is best to help a departing employee leave with dignity – regardless of the reason they are leaving.